Arrive in Palermo and you will be met and transfer to your hotel. That night, have dinner in the hotel and rest up for the adventure that lies ahead. Enjoy breakfast at the hotel, and then head out on a morning excursion to Monreale, recently included on the UNESCO World Heritage List, an ancient royal town famous for its almonds, olive oil and citrus fruits, as well as for its fine Norman architecture. 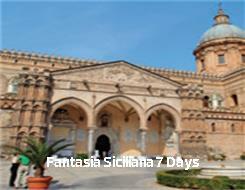 Visit the elaborate Cathedral of Monreale and then enjoy some shopping of local delicatessen and souvenirs. Back to Palermo and continue with a walking tour of the city. Wander the streets of the Old Town, hearing tales of Palermo's 3,000-year history and discovering attractions like Palermo Cathedral. Walk inside the impressive-looking place of worship and marvel at its arches, cupolas and mosaics - with an incredible mix of influences coming from several dominations on the island. Enjoy free time in the late afternoon and return to your hotel for dinner. Overnight. Early breakfast and departure to Erice, a medieval village stacked into the side of Monte San Giuliano. Many say that little has changed in the village since the sixth century, and its labyrinth-like twist of lanes is perfect for a cool and pleasant morning amble.Continue to visit the Saline ,an extraordinary lagoon, where history, nature, archeology find a perfect synthesis and allow the visitor to try different, unique and charming experiences. Have a nice boat trip to the islands, located nearby. The tour of the natural reserve of the "Stagnone di Marsala" is a one of a kind archaeological and naturalistic experience. Board on these special boats, designed ad hoc to be able to navigate in the lagoon bottoms that at low tide reach only 25 cm. With a helpful audioguide, you will admire all the islands of the lagoon of the Stagnone up close, remaining comfortably seated in the boat, sailing at a speed of 4 knots. You will pass from the Island of Mozia, Isola Lunga, Isola di Schola, from the Ancient Via Punica Sommersa. After this wonderful experience enjoy your lunch in a restaurant by the lagoon. Return to your coach and travel to Agrigento, your final destination of the day. Visit Ancient Greek monuments and ruins at the Valley of Temples (entrance included) - a UNESCO World Heritage site - and learn about archaeological relics like the Classical Temple of Concord the Temple of Hercules; the Temple of Jupiter, one of the largest Doric-style buildings. Check in to your hotel in the evening. Dinner and overnight. Breakfast at the hotel and travel to Piazza Armerina a pretty and historic town nestled into the heart of Sicily. Entrance in Villa Romana del Casale to admire the largest, richest and most complex Roman mosaics in the world. It is one of the many UNESCO World Heritage Sites in Italy since 1997. The mosaics spread over 3,500 sqm show mythological scenes and portrayals of daily life. Depart to Ragusa and visit of the enchanting historical centre "Ibla", with its stunning baroque palaces and churches; together with other seven cities in the Val di Noto, Ragusa is listed among the UNESCO World Heritage Sites. Visit the old gate of San Giorgio, the Giardini Iblei and then walk to Piazza Pola where we will visit the church of San Giuseppe: a little gem. Be enchanted by the elegant Cathedral of San Giorgio, the Church of the Souls in Purgatory and the magnificent Cosentini palace, one of the most interesting Late Baroque palaces in Sicily! Arrive in hotel, dinner and overnight. Breakfast at the hotel and travel to Noto, a picturesque fishing town popular for its stately Baroque architecture. Visit Cathedral of San Nicolò, recently restored after a earthquake, and then have a nice walk in the town's center. Continue along the south coast to Syracuse, on Sicily's southeastern tip. Visit "Parco Archeologico della Neapolis", Syracuse's famous archaeological area, home to a vast collection of Greek and Roman ruins from all over Sicily. Head inside to see impressive landmarks such as the Greek Theater, the Roman Amphitheater and the Ear of Dionysius – an artificial limestone cave. After the visit, cross one of the city's bridges for a visit to the island of Ortygia – the most ancient part of Syracuse - home to a wealth of Baroque churches and medieval palaces. In the late afternoon arrive in Taormina, check in to your hotel and enjoy dinner. Breakfast at your hotel and then head off to Mount Etna, the largest active volcano in Europe and the highest mountain in Italy. Learn about volcanic activity and marvel at the old lava fields and black magma rock that comprises Etna's landscape. If weather permits, you have a chance to climb to the summit (1800 m). After, return to Taormina, the beautiful and romantic town located on Mount Tauro. Return to Taormina in the afternoon and spend the rest of your day at leisure. Dinner and overnight. Typical Villages off-the beaten track!